Cameo Colours, where have you been all my life!! 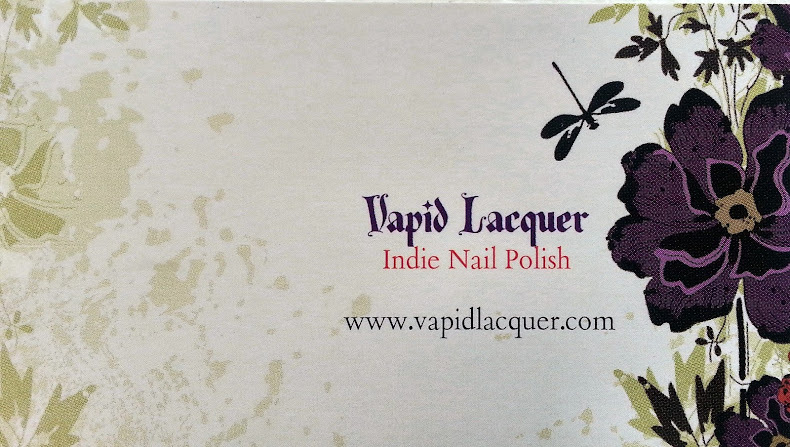 Another gorgeous brand i have only just discovered and got some polishes ordered from. Cameo Colour Lacquers is run by a fab girl called Cameo (what a cool name!) 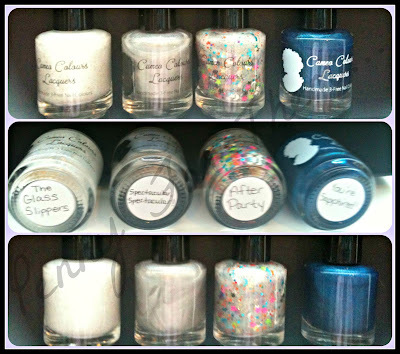 She lives in the USA, and has been mixing polishes since May 2012 and released her first ones to sell on June 13th 2012. Believe it or not, Cameo had sold 100 bottled BEFORE her shop was officially opened...that's alot considering she only started to mixing just one month before she started selling! Her Etsy store was opened on August 21st 2012, and has been running ever since UNTIL 16th August this year when Cameo has now got them all for sale on her website (www.cameocolourslacquers.com). 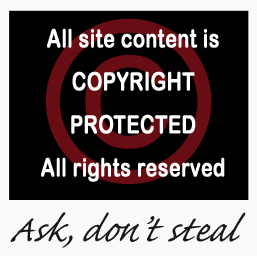 So don't try and buy from her Etsy store as from the 16th August 2013, as you wont be able to! The new Cameo store looks to have some new shades in which look amazing and I'm trying not to fall to my poor will power when it comes to sparkly pretties like these!! Onto the ones i bought to review. I'm sooooo pleased with the ones i got, and you'll see why in a mo! Great polish to use. The "Glass Slippers" is a thick almost snow white effect crelly polish and only needed 2 coats. Cameo describes this delicate beautiful polish as "a white polish, packed full of duochrome shimmer, gold, pink, violet, blue and green glass effect flakies and a smattering of tiny iridescent and silver holographic glitters"...phew a mouthful but so accurate! I'm not normally a massive fan of whites, but this one is really pretty and great to work with! The "Spectacular, Spectacular" in total contrast is much thinner and needed 3 coats, but it suited the polish, if you get what i mean! you don't want a thick holo coat, and this one can be used easily on top of another colour to add a new dimension to that polish, so its a double whammy! Cameo writes this one up as her "quadruple-grade Spectraflair top coat that will make any basecoat polish..yup, SPECTACULAR!! Can also be used on its own!" 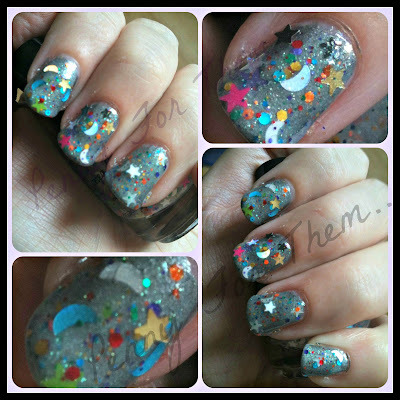 The beautiful and multi pieced glitter fest "After Party" can be used by itself but I decided to wear an undie in this case and so only needed to apply one coat. The Undie was a Sparkles By Julie polish called "Moon Dust", a deep muted silver (which, by the way has been discontinued!). The glitter just oozed out on each brush stroke as the pictures show- a great coat to use on top of another colour to make it look totally cool. Quite a thick clear polish so not much is needed of the actual polish. You might need to remove done excess polish from the nail after you have the desired amount of glitter on, but it takes literally seconds and well worth it. "After Party is a glittering mix of metallic rainbow glitter, moons, stars, and circles in many colours, sizes and finishes, floating in a base that appears milky with a blue-green shimmer, but applies almost fully sheer and glows blue after light exposure!" 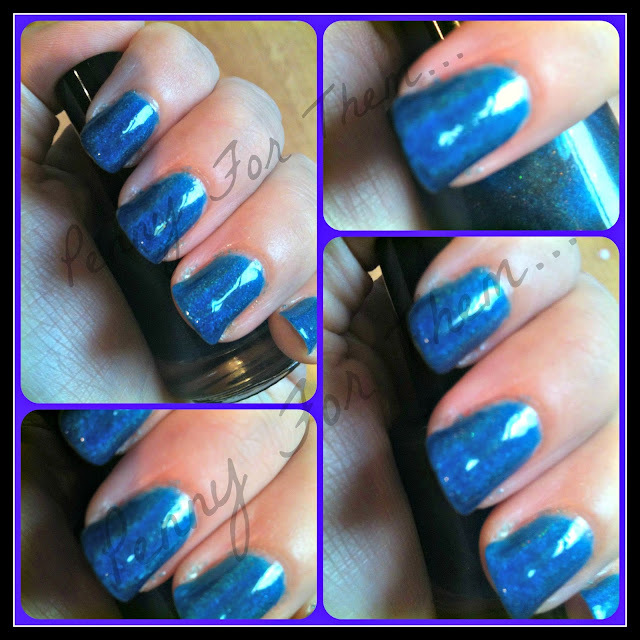 The last one, "You're Sapphired" is just a beautiful and gorgeous bright blue linear holo. I got this one as I don't have a blue or a holo like it (and I'm trying to be good and steer clear of dupes to ones I might already have..... But looking at the store there's no way I have any dupes of Cameo's polishes!! OK, so last polish description! ON Cameo's site this one is described as "a blue linear holographic polish. It looks different in changing lighting, indoors it appears dark blue, but in the sun it looks VERY bright". I didn't get very good shots of "You're Sapphired" - its a great bright blue holo that shines gorgeous in the sun! Each polish has a base coat of Opi Natural Base Coat and a luscious top coat of the glossy Gelous. So, yeah, first order, but last? I don't think so!! Especially when I'm looking at the new stock and omg are they just gorgeous new colours!! Would definitely recommend the "Spectacular, Spectacular" as it can be used in so many different ways! So was i right, or was i right? Cameo has great polishes, each tailored to their own style and appearance. No matter what kind of polish, a gorgeous thick polish with a textured appearance, to a thinner holo polish use able on top of other colours. What are you waiting for??! Look below for ways to find Cameo and get in there! !